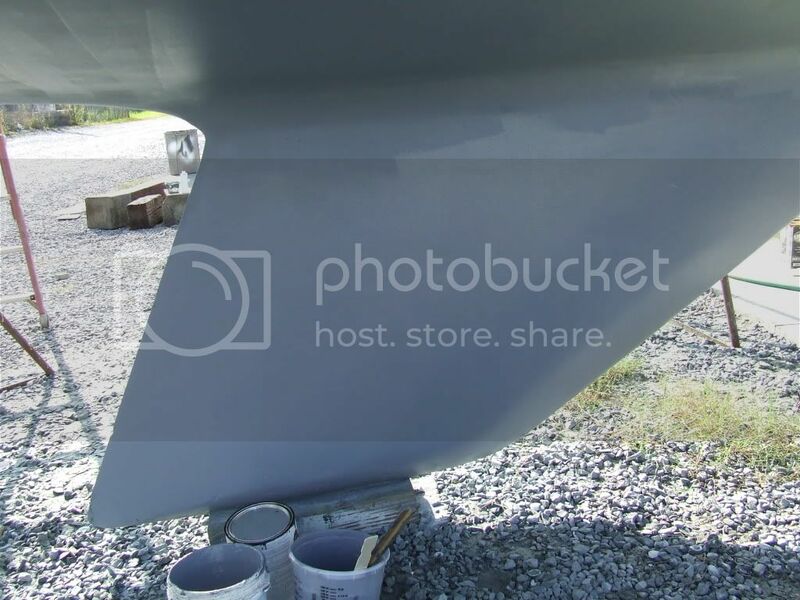 We've been busy this past week doing the final preparations for painting the sailboat's bottom. 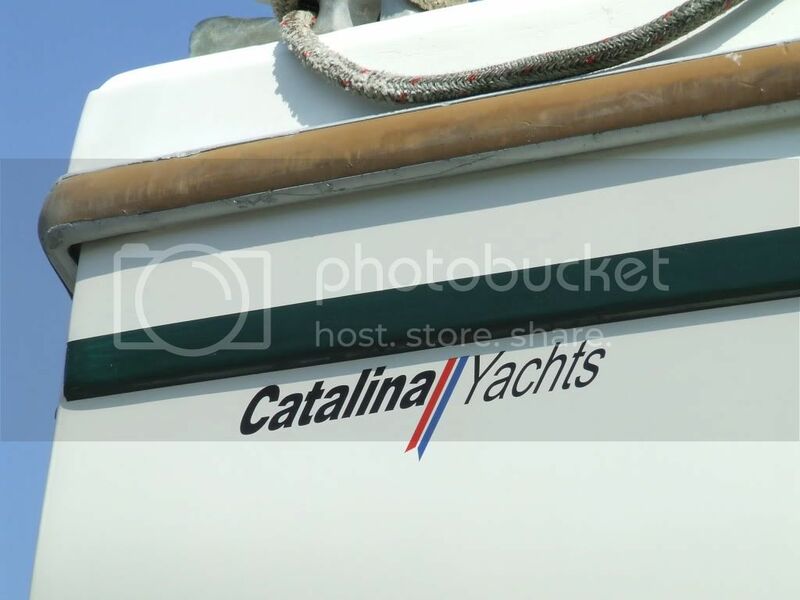 Last Saturday we applied our new Catalina decals, as we really love our Catalina and wanted to make her official again. We planned on performing the denaming/renaming ceremonies that night, but the rain messed up our plans. The following day was Father's Day, and we spent it with our daughter at the water park in Baton Rouge. We don't get to spend enough time with our 18 year old, so it was a great day. No better way to spend a day in the heat than in the water park - much better than the boatyard! We originally planned on spending the day in the boatyard, so my dad (who is the best) was great about the whole Father's Day thing and said he'd gladly accept a rain check. I'll make it up to him soon. This past Tuesday and Wednesday we installed the new thru-hulls, installed the new depth and speed transducers, filled and sanded the area where the strut meets the sailboat bottom, removed and replaced the cutlass bearing inside the strut (how-to in later post), added anodes (zincs) to the propeller shaft to prevent corrosion, and completed repairs to the keel by applying marine filler. We also washed the boat yet again so she'd be clean the next day and ready for painting. 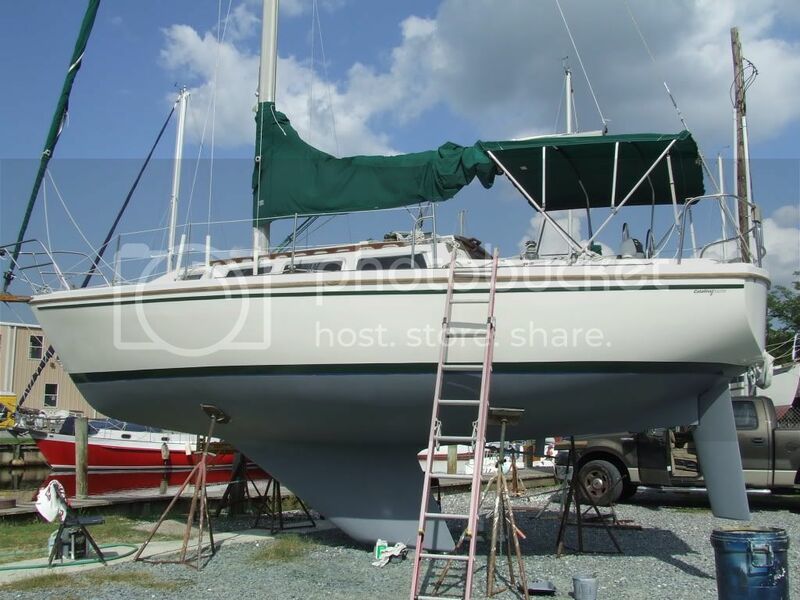 Thursday we were ready to finally start painting the sailboat bottom. This day couldn't come soon enough! 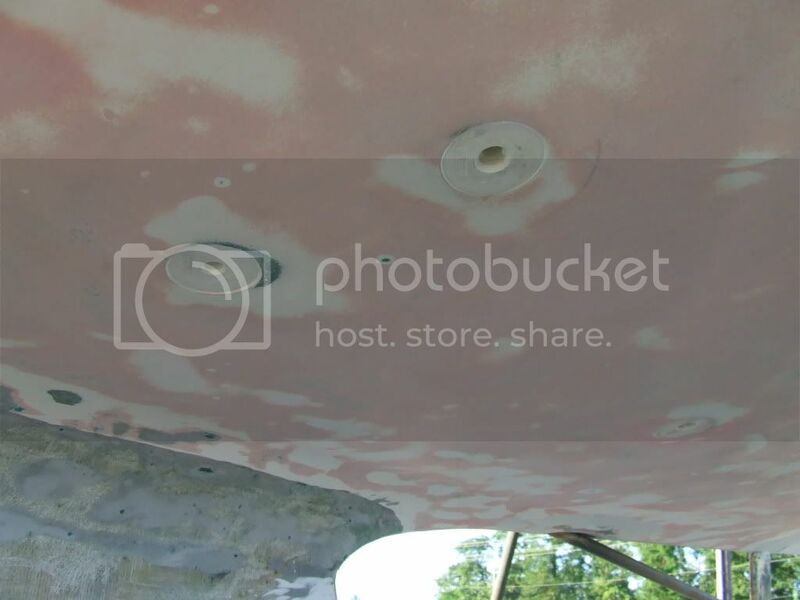 We got to the boatyard early in hopes of applying three coats of primer/barrier paint (Petit Protect, two-part) and the first of two coats of bottom/anti-fouling copper paint (one part, Petit Trinidad 75 - one can of black and one can of light blue, which I'd called electric blue). We needed to wait three hours between the three barrier coats. We also needed to apply the first coat of anti-fouling paint within 6 hours of the final barrier coat in order to prevent having to sand the entire bottom. Luckily the weather held out and we got all four coats of paint on the boat, which meant no sanding! It took us about an hour each time to apply a coat of paint to the bottom. Needless to say we were pretty disgusting after spending a long day painting in a heat index of 105 degrees. I'm still trying to get the paint off of me! 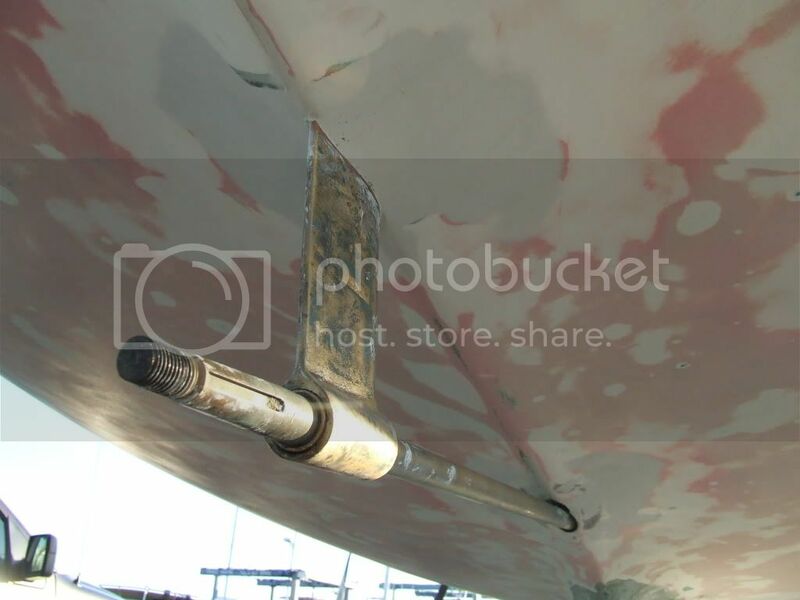 Friday we only had to put the second coat of anti-fouling paint on the sailboat bottom, and we were done pretty early. What a great feeling when I was rolling the last section for the last time! Ken and I spent the remainder of the day ordering a new anchor, along with the chain and line to go with it. We lost the anchor that came with the boat (don't ask - it fell off) and we felt we needed to have an anchor before we left the boatyard. We also received our new 3-blade propeller, which we'll need to put on the shaft this weekend. Friday afternoon we went back to the boatyard to have the guys that worked there move the stands holding up Nirvana so that we could paint the area behind the stands. This is a common procedure, and it should be nothing to be concerned about. However, Ken and I almost had a heart attack when it became obvious that the stands weren't being placed properly to support the weight of our sailboat. We tried to be patient and give the guys the benefit of the doubt. I had to walk away when the sailboat slipped slightly the first time. When it slipped again about 2-3 inches (that's a lot, believe me) the second time, it was time to get the lift! I witnessed this second "slip" and my heart was in my throat! There's nothing worse than seeing your beloved sailboat that you've worked on so hard for over 2 months start sliding in the stands. One of the stands starting turning and luckily stopped just in time to "catch" our sailboat from sliding any further. This was way too close to disaster! 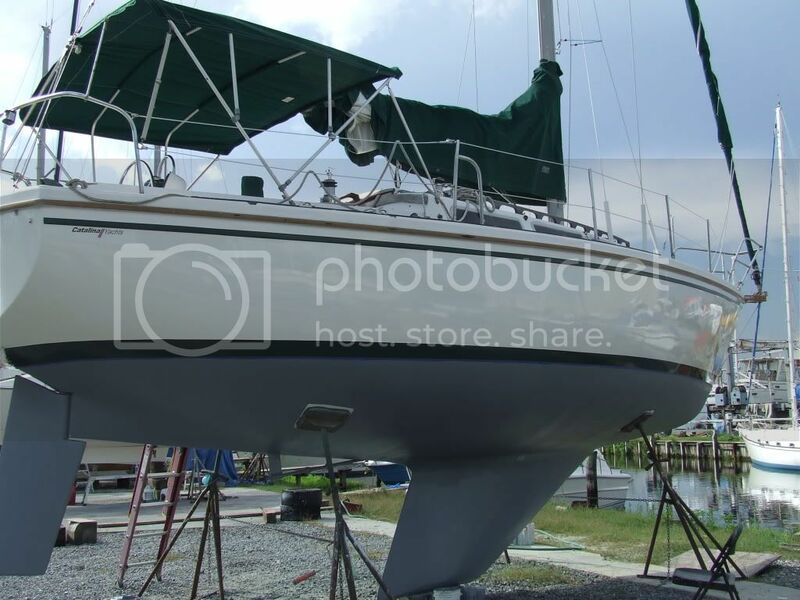 Anyway, the boat was lifted and replaced properly on the stands for us to finish the touch-up painting. Whew! Later last night we finally got around to performing our denaming and renaming ceremony (later post). It was a perfect time to do it, as we were ready for a drink! We got cleaned up and met a few of our friends at the boatyard with some champagne. We performed the ceremonies with champagne on the bow and a green-leafed branch on the deck for good luck. It was a great way to end a hard and stressful week. We plan on placing Nirvana's name this weekend, as well as putting on the prop and painting those places where the stands were. 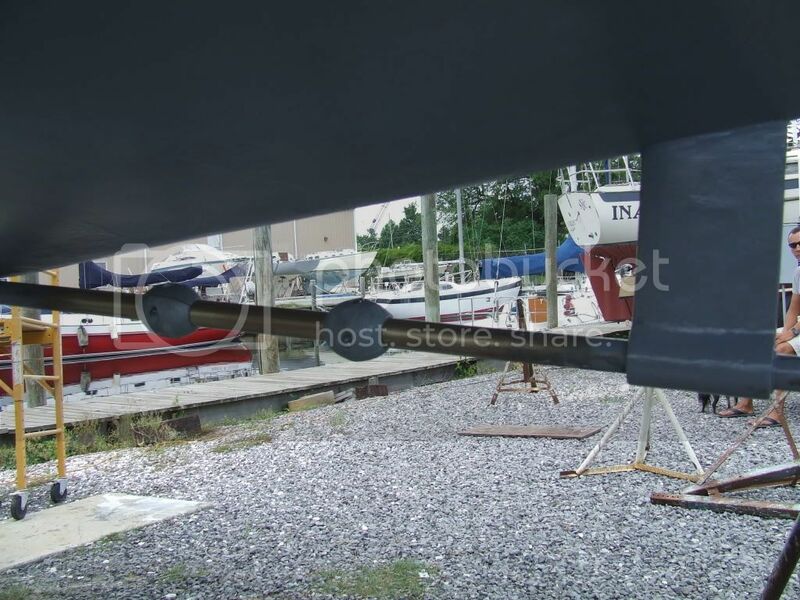 We also need to re-install the fuel tank and glass over the area inside the sailboat where we needed to tighten the strut bolts. We're downhill from here, and hope to have Nirvana in the water within the week. Your boat looks brand new! Great job, guys. Wow!! Nice job - she looks beautiful! 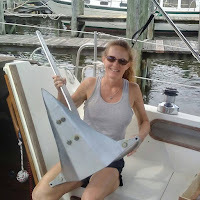 And oh my god - I would DIE if I saw my boat slip on stands - ugh...that is scary scary scary!! Glad everything worked out for the best!! Congrats guys!! 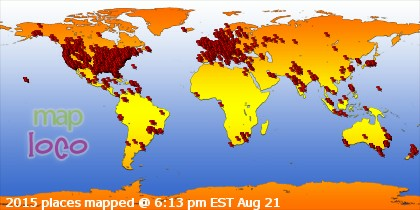 As usual, it looks incredible. The moving the stands bit sounds scary! Holy Cow! Thanks guys! We're happy with her and can't wait for the rain to stop so we can go sailing! Moving the stands was scary! Boatyard said they've never dropped a boat, but they were scared too!